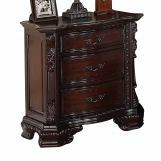 Traditional elegance melds with today's modern home with the Sheffield Collection. Each piece is unique and full of rustic charm. 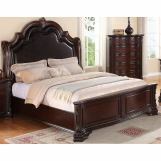 The traditional styled panel bed is available in queen or king. 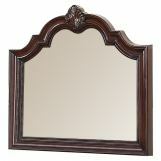 It has upholstered headboard panels, stout, bracket legs and matching side rails. 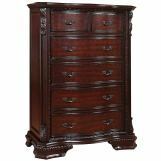 The dresser, topped by the large mirror, has 9 drawers and the nightstand 3, both offering ample storage space. 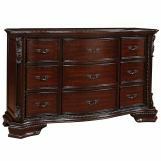 Traditional styling flows with the classic pillasters, paneled sides, raised drawer fronts, nickel plated hardware and decorative nailhead trim. 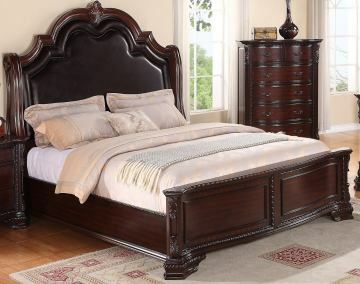 The Sheffield Bedroom Collection is a perfect lifetime partner to any home.